Cheap flights to Greece: Warsaw-Thessaloniki for €62! Ryanair now offers cheap flights to Greece. 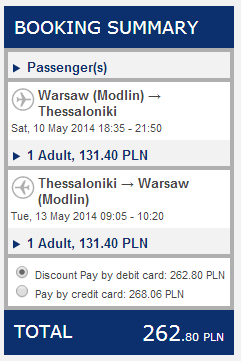 Return flights from Warsaw to Thessaloniki are available for only €62 / 262 PLN! Many other dates are available for higher price. « CHEAPEST flights to Mexico in history! Cancun for only €240!